When it comes to eyeshadow I always play it safe and stick to what I know, neutrals are my go to eyeshadow shades. Whether it’s for day time or even night time. 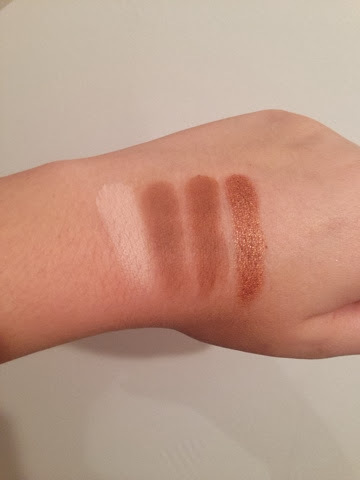 I want to reach out of my comfort zone and use brighter and bolder shades but until then I will give you a quick run down of my favourite neutral eyeshadow palettes. Top to bottom: omega, wood winked, vanilla, wedge. Omega, vanilla and wedge are all matte shades and wood winked is more of a shimmer shade. I use omega to fill in my eyebrows as it is a matte shade and is the perfect colour for my brows. I sometimes use vanilla to even out my skin tone on my eyelids, and to highlight my brow bone and inner corner. I tend to use wedge on top of vanilla as a wash of colour and wood winked in my crease. I use these colours on a day to day basis as it’s quick and easy to create a nice smokey eye even on a school day. 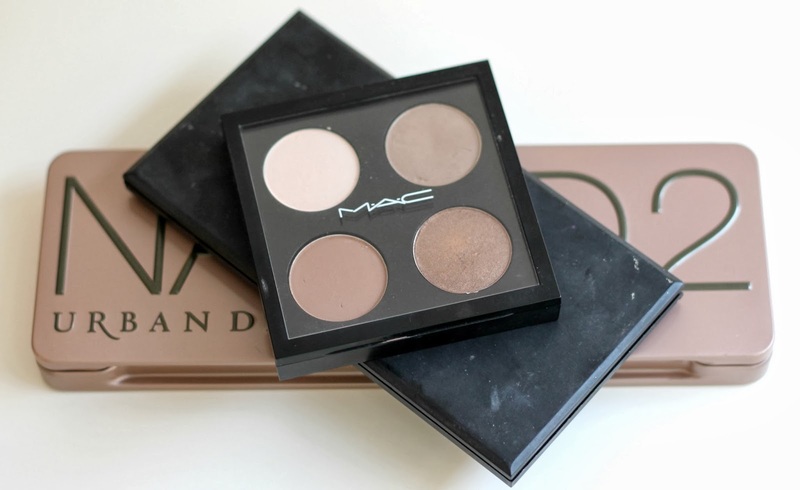 All of the mac eyeshadows are very blend able and the colours are equally as build able. Each mac eyeshadow in pan form (which is shown above) are £10 each and the palette that holds 4 eyeshadows is £6.50. I really like the idea of building your own palette up with all of your favourite shades because then you know that you will use each colour and there won’t be that one that you don’t tend to use up. L-R: Foxy, half baked, bootycall, copper, tease, snakebite, suspect, pistol, verve, YDK, busted, blackout. If I want to make more of an effort with my eyes I tend to reach for my urban decay naked 2 palette. It has 3 matte shades (foxy, tease and blackout) and the rest are shimmers. My go to shade in this palette is bootycall. I would say that bootycall is the same as naked lunch by Mac. So if I’m in a rush I will swipe the lids with bootycall and add a bit of eyeliner and I’m done. It’s a very nice champagne colour with a bit of shimmer. 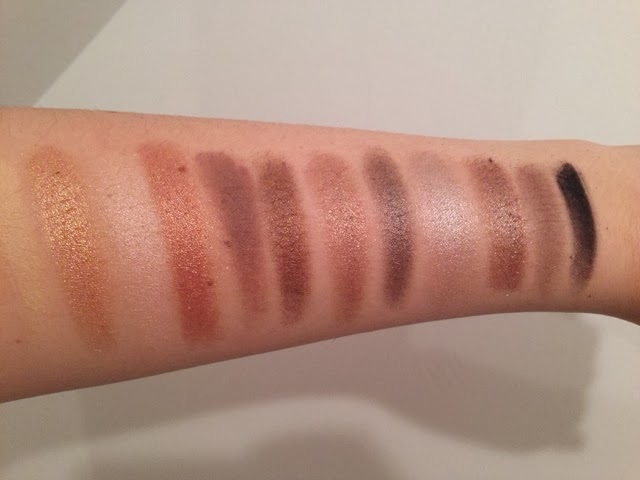 This palette is very versatile, you can create so many different looks with these eyeshadows and they have amazing colour play off and pigmentation. This palette costs £37 and you get a free sample of an urban decay lipgloss. I think that this palette is very good for the price because it has 12 shades and they are all equally as pigmented and all easy to blend. Top: nougat, nubuck, cappuccino, honeycomb, toast, taupe. Bottom: conker, moss, bark, mineral earth, regal, noir. 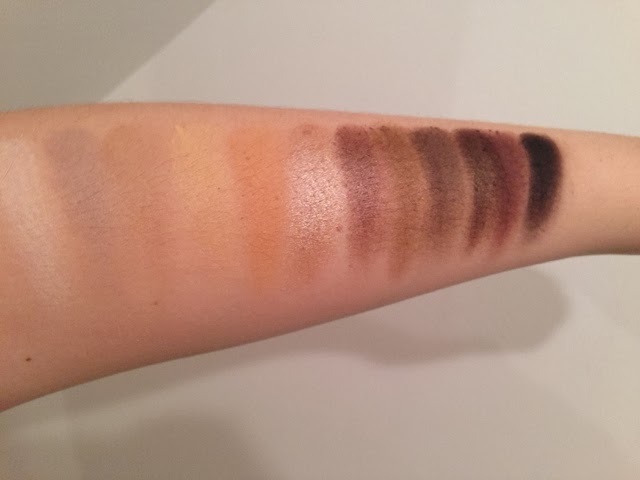 For more of a budget palette I have chosen this palette by sleek. It’s called the au naturel palette. I love sleek eyeshadows because they are so pigmented for the price. As you can see this is a well loved palette and taupe is my favourite shade out of them all. This palette has some matte and shimmery shades in it, and like the other two palettes all of the shades are easy to use and blend. The sleek palettes are £7.99 and I find this an amazing price for the quality of the product. I do find that some of the shadows create fall down and don’t normally last as long on the eyes as the mac or urban decay palettes. But you can’t complain for the price of the product. What are your favourite neutral eyeshadow palettes? Next Post This or That Tag!